DENHAM SPRINGS - Officers escorted an arrestee from the Denham Springs Police Department Tuesday morning. She wasn't the typical inmate. Her name is Rosie, and she's a 65-pound pig. 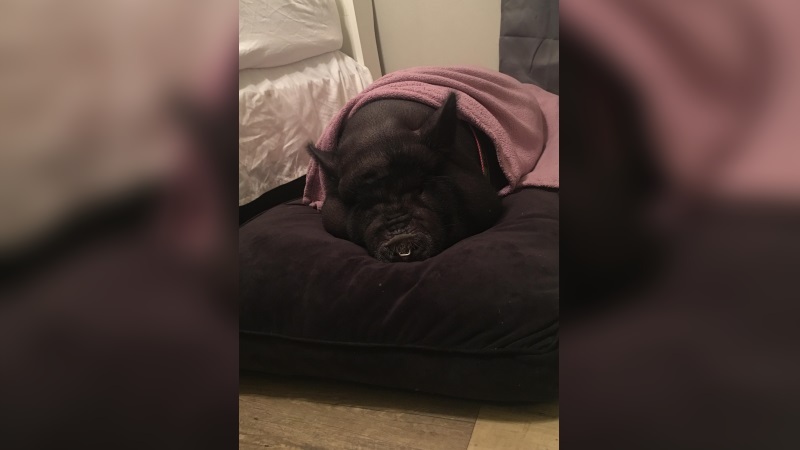 Officer Benjamin Payne thought he would be able to handle Rosie easily when police got the call about a pig wearing a harness roaming in yard where she didn't belong. Payne said he works well with animals, but got a surprise when he arrived at the scene. "I figured it was just going to be somebody's pet miniature pig, so I didn't think it would be a big deal," Payne said. After further examination, Payne changed his mind. "This is going be a little more challenging than what I thought," Payne said. "I had to jump on top of it and I was wrestling the pig until I could get it leashed." A man who claimed Rosie wouldn't give his name, but allowed her to ride home in the front seat of a Lexus convertible. He did talk to a reporter to make one thing completely clear. "This my wife's pig," he said. Rosie's owner says she made it back home safe and sound Tuesday night, where she had a much-needed rest.